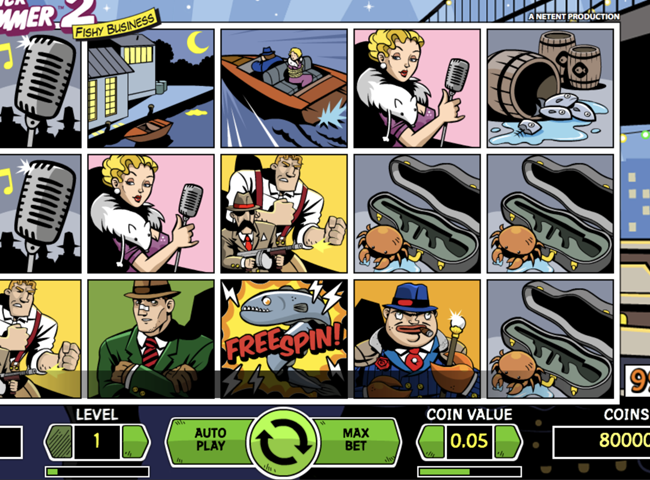 Jack Hammer 2 Slot is Netent’s follow-up to 2011’s Jack Hammer – Evil Dr Wuten – a hugely popular slot game featuring a Private Eye investigating crimes in the smokey underworld of 1930s Grand City. Jack Hammer 2 – Fishy Business is a 5 Reel slot with 99 paylines and a 97.1% RTP (Return to Player). It is also a high volatility slot – so you can expect big but infrequent wins, and be careful with your bankroll because this slot tends to take some cash before paying out. The draw of this game, as well as the cool cartoon graphics, which make this NetEnt’s alternative to the Marvel comic series from Playtech, is the Sticky Wins feature carried over from the first version of the game. More on these later in this review. The game is available to play on mobile, tablet and desktop. Like other top NetEnt slots, including Gonzo’s Quest, Jack Hammer 2 opens with a short animated clip. In this case, our hero is being honoured for his work in saving the Great City in the first version of the game. But trouble is never far away, and meanwhile a beautiful singer named Pearl is being kidnapped by evil criminal mastermind, crab-clawed Don Crabby. Our hero must rescue Pearl from Don and his henchmen. The cartoon illustrations in Jack Hammer 2 are once again excellent – think Batman in it’s heyday. The key symbols here are: Jack Hammer represent the highest paying symbol – match 5 of the star of the show to earn 500x your bet; Pearl the singer, is second highest, Don Crabby is third, and his henchmen fourth. Other symbols with smaller payouts include a motorboat, a barrel of fish and an empty gun case. There is also the Wild symbol, the word WILD written like its straight out of a Batman comic from the 60s and 70s. It substitutes for all other symbols except the Free Spins symbol which is an electric eel. If you choose to play Jack Hammer 2 video slot, then remember this is a high volatility game, albeit with a pretty decent 97.1% RTP. So manage your funds carefully and be ready to spend some before you win. You can set your stake levels by altering the coin value – from 0.01 to 0.5 – and your bet level from 1 to 10. Your stake range per spin on the 99 fixed paylines is from a minimum of 50p up to a maximum of £250. Outside of the big band sounds from the opening scene animation, the soundtrack to Jack Hammer 2 is sparse. But you can still turn it off in the settings options should you choose. On to the good stuff then, and here is a breakdown of the features on this game. Sticky Wins – this feature, that made the original Jack Hammer game so exciting, is also a highlight of the follow up. Any winning combination is held, and a re-spin ensues, which can lead to more wins, and another hold. This keeps going, leading to super wins with big payouts on some occasions, until there is a losing spin. Free Spins – The electric eel symbol denotes free spins and should it appear five times across any reels at any point, the Free Spins feature is triggered. 5 of the eels brings 10 Free Spins, 6 brings 13, 7 brings 16 and eight or more brings up 20 spins. Whilst you can win more spins in the bonus round there are no multipliers in the game. However, two extra wilds are added to the reels during Free Spins and all prizes are doubled. Fans of the original Jack Hammer Slot will love this game, it has all the star quality of the original, and fulfils the NetEnt tradition of fantastic entertainment with an engaging storyline and beautifully rendered animations. Whilst the game is a little short on features and bonuses, the Sticky Wins gameplay and Free Spins round will bring some big wins along for those patient enough to wait it out.